A Sneak Peek at Chapter 3 of Hank #71! And, if you want to find out if Slim takes Woodrow's advice, be sure to check out the rest of The Case of the Monster Fire! Slim was coming down the hall, tucking in his shirttail. Good. He could take the lead on this deal and I would provide backup. I dived under the…that is, I found myself beneath the coffee table and started pumping out some cover fire. Awesome barks. He went to the door and yanked it open. There stood…hmmm, it wasn’t a robot, as you might have thought. It was an old guy: white hair, bushy eyebrows, smoky gray eyes, and red suspenders holding up khaki pants that bagged in the seat. I sent this info to Data Control and got an ID: Woodrow, Viola’s daddy. See? What did I tell you? We’ve never had a robot show up at Slim’s place and probably never will. I’ve tried to drill this into the troops: stick with the facts and don’t let your imagination run wild. Drover is the very worst about making a mountain out of a mohair. Slim brought a chair from the kitchen. When Woodrow sat down, it collapsed, I mean sank into a heap of rubble. Slim had to pull him out. “Sorry, Woodrow. I’ve been meaning to fix that thing.” He brought another chair from the kitchen. 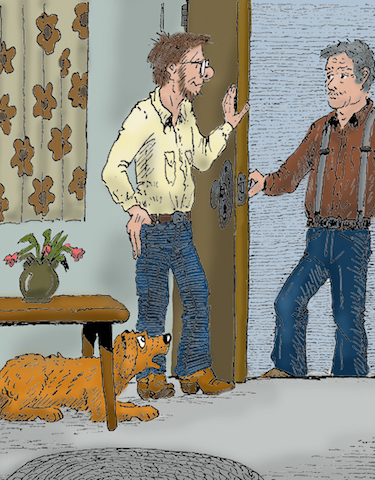 “Here, you take the easy chair and I’ll…” Woodrow waved him off and sat in the kitchen chair. It held. Wow, that killed every fly in the room. Slim’s adam’s apple jumped and he blinked his eyes. There was a moment of deadly silence, then the old man’s lips twitched into a wicked little smile. “That’s just what I thought you’d say.” He pushed himself out of the chair and headed for the door. He went out the door. Slim sat there for a moment, then flew out of his chair. It kind of caught me by surprise and, well, I fired off three barks. He sailed out the door, I followed, and we caught up with Woodrow as he was about to get into his pickup. He trudged back to the porch, walking like a sad old man, all bent over and frowning. I must admit that I didn’t understand any of that conversation, except the part about taking a bath. Maybe that was it. He had to take a bath and it wasn’t even Saturday. That can put a guy into a dark mood, I guess. It really didn’t matter if I understood or not. Dogs don’t understand half of what goes on with our people, but that’s just part of the job. What matters is that we’re there to walk beside them. We’re there when they need us. I would walk with Slim all the way to the bathtub and give him comfort in his time of need. I might even drag his jeans into another room and fling them around in my jaws. I kind of enjoy doing that. No what? I hadn’t done anything. Well, gee, that seemed kind of harsh. How could he take a bath without…he went inside. A few minutes later, the door opened and Stubtail came flying out and landed on the porch. Have you had a chance to read Hank #71 yet? We love hearing from you!! Be sure to leave us your thoughts in the comments below!